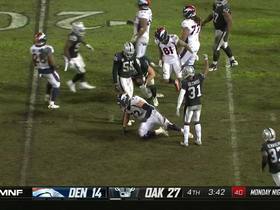 The Raiders forced two turnovers and held the Broncos to 14 points in Week 16. They will face the Chiefs in Sunday's season finale. 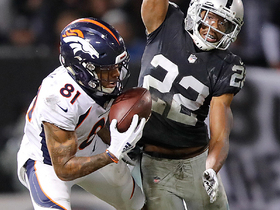 The Raiders feature the worst-ranked scoring defense in the NFL (29.9 PPG) entering their Week 16 game against the Broncos. 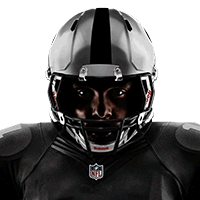 The Raiders boast the league's 28th-ranked total defense (392.2 YPG) entering Week 15. Oakland ranks 28th in the NFL in total defense (396.6 YPG) entering Week 14. Analysis: It's been tough sledding for the Raiders who have struggled to adopt an identity through 12 games this season. Over their last two games, Oakland has surrendered a combined 74 points. Oddly enough, the Raiders have given up at least 20 points in every contest this season. With the Steelers on the immediate horizon, there's no reason to consider Oakland in Week 14. Better luck next year with this squad. The Raiders allowed 416 yards during last Sunday's 34-17 loss to Baltimore. They'll take on the Chiefs in Week 13. 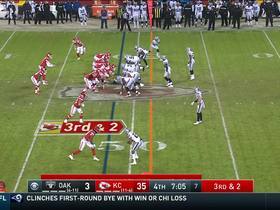 Analysis: Even worse, Oakland was gashed for 242 yards on the ground. In some respects, a lacking of ample film on Lamar Jackson didn't help, but Oakland officially looks lost on defense. 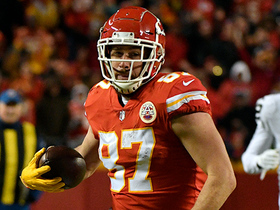 Sunday's game against Kansas City has the makings of a potential blowout, especially with the Chiefs coming off a bye. Oakland likely has its sights set on April's draft. The Raiders feature the 26th-ranked total defense (387.4 YPG) entering their Week 12 matchup with the Ravens. The Raiders enter their Week 11 matchup with Arizona as the league's 30th-ranked scoring defense (30.2 PPG). Analysis: It's been a tough start out the gate for Jon Gruden, who has seemingly faced increased scrutiny with every decision made. For Oakland, the last two months of the season will be about building momentum for the 2019 season. With a poor pass rush and spotty secondary play, Oakland has been seemingly exposed week after week. Arizona doesn't have an intimidating offense, but David Johnson should be licking his chops when looking at this week's game film. Raiders cornerback Daryl Worley is nursing a shoulder injury ahead of Sunday's game against the Chargers. Raiders defensive end Bruce Irvin is dealing with a shoulder injury ahead of Thursday's game at San Francisco. Oakland enters their Week 8 matchup with Indianapolis ranked 29th in the NFL in scoring defense (29.3 PPG). Oakland has the NFL's 30th-ranked total defense (404.4 yards per game) heading into their Week 6 matchup with the Seahawks in London. 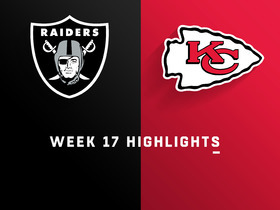 Analysis: The Raiders have surrendered at least 20 points in each game this season and have given up 30-plus points in two of their five bouts. Suggesting the Raiders as a viable option seems like blind faith more than anything at this point. Sunday's date with Seattle will give the Raiders a chance to expose a weak offensive line, but QB Russell Wilson is a headache for defenses for a multitude of reasons. 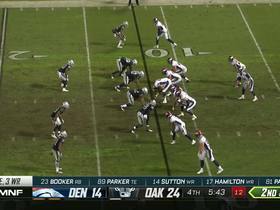 Avoid the Raiders D/ST until they give a reason for attention. The Raiders conceded 42 points to the Browns in Week 4. They'll take on the Chargers in Week 5. Raiders defensive end Bruce Irvin (knee) is listed as questionable for Sunday's game against the Browns. Raiders defensive lineman P.J. Hall (ankle) is listed as questionable ahead of Sunday's game against Miami. Oakland defensive tackle Justin Ellis (foot) is in jeopardy of missing Sunday's Week 2 contest against the Broncos. Defensive tackle Treyvon Hester has been ruled out for Sunday's game against the Chargers. Defensive lineman Mario Edwards and Treyvon Hester have both been ruled out for Monday's game against the Eagles with ankle injuries. Defensive end Mario Edwards was ruled out for Sunday's game against the Cowboys with an ankle injury. Raiders linebacker Cory James is nursing a knee injury ahead of Sunday's game against Kansas City. 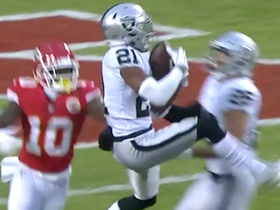 Cornerback David Amerson is listed as questionable for Sunday's game against the Giants with a foot injury. The Raiders still have yet to record an interception this season, extending the NFL record to 10 games. Cornerback David Amerson is listed as doubtful for Sunday's game against the Patriots with a foot injury. The Raiders have surrendered 30 or more points in three of their last four games. 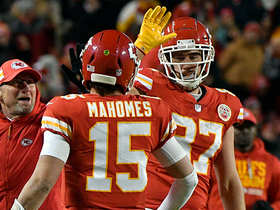 Kansas City Chiefs quarterback Patrick Mahomes hugs tight end Travis Kelce after breaking the record for the most receiving yards by a tight end in a single season. Kansas City Chiefs quarterback Chad Henne finds fullback Anthony Sherman for a 7-yard gain. 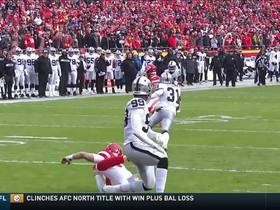 Oakland Raiders cornerback Gareon Conley intercepts Kansas City Chiefs quarterback Patrick Mahomes on a deep ball throw to the end zone. 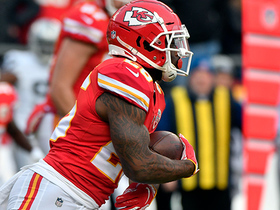 Kansas City Chiefs quarterback Patrick Mahomes spins out of a sack and finds fullback Anthony Sherman for a 12-yard gain. Denver Broncos wide receiver Tim Patrick make a great catch in tight coverage for a 26-yard gain against the Oakland Raiders.